A funny book is a boon to a struggling reader. I learned this when my son hated to sound out words! Hated it!!! Although I stopped trying to force him to learn to read (<– I tell you about it there), funny early readers were the ticket when he was finally ready. Elephant and Piggie is the classic funny early reader series, and the titles on this list are excellent for kids who like Elephant and Piggie, or books like Frog and Toad! 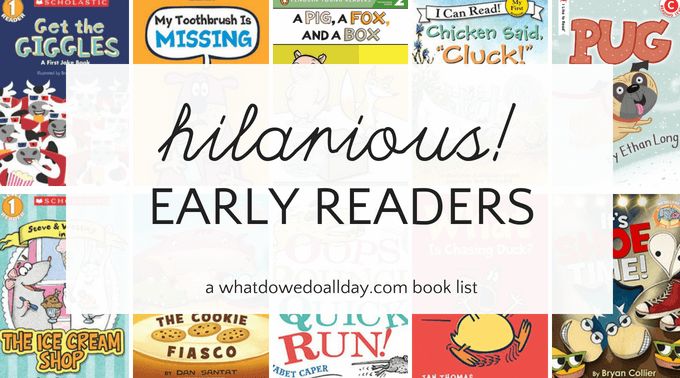 Thanks in part to funny beginning books, both my children are now voracious readers, and they still love funny books, so much so that I even made a list of our top 100 funny chapter books! The Giggle Gang series by Jan Thomas. I was so excited to learn that my favorite story time author now has a funny early readers series! If you have never read a Jan Thomas book, you are in for a real treat and if your child is still reluctant, pick up one of her picture books to read aloud. 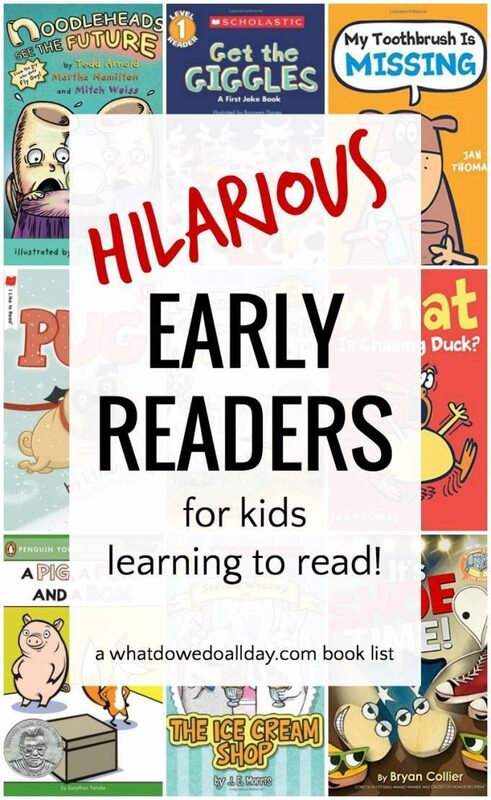 Your child will laugh so hard he or she will want to make sure not to miss the giggles in the early reader books, too. Mr Monkey Bakes a Cake by Jeff Mack. I have loved Jeff Mack’s books in the past and I stumbled across this one at the library because it was set out as a featured title. It was truly wacky, and full of hijinks, as you might imagine. It looks like it is the start of a series, so take a look! Elephant & Piggie Like Reading series, various authors. These books are not by Mo Willams, but by various authors like Dan Santant, LeUyen Pham and Brian Collier. They are cheerful and appealing and while Elephant & Piggie should still be on your list of easy readers, be sure to expand out to these books, too. Steve & Wessley series by J. E. Morris. This quirky duo is the classic comedy routine straight man and clueless man. Although in this case it is straight bunny to clueless mouse. There are two books right now and they are extremely easy to read and quite silly. Get the Giggles by Bronwen Davies. This book was a real winner when it came to my son learning to read independently, as I wrote about in how to use jokes to enhance literacy. The jokes are actually quite funny but beware! You might hear them over and over and over again. Books by Ethan Long. I can’t really single out one title by Long. He has several in the “I Like to Read” series, and they are all funny early readers. In fact, I like all the books in this easy series, not just Long’s. They are all truly easy to read. Noodleheads series by Tedd Arnold. This is another very silly series by the author of Fly Guy, which could easily be on this list. (I left it off because it is already so well know.) I recommend them for kids who have mastered level one reading books because there are some more challenging words, and not as much repetition. Still, who wouldn’t love a story about talking ziti? Oops, Pounce, Quick, Run! : An Alphabet Caper by Mike Twohy is a simple alphabet book with a twist. Each page consists of one word beginning with subsequent letters of the alphabet. But on their own, the words are meaningless. Here the story is in the illustrations, which is an excellent lesson in reading comprehension. Kids might need help with a few of the words — “catch,” for example — but they will be easy to figure out by looking at the pictures and there are plenty of easy words like “ball” and “dog” to keep the pace moving. A Pig and a Fox books by Jonathan Fenske. Very funny rhymes tell the story of a very silly duo. Each book is divided into three stories so if kids want to take a break mid-way, they won’t lose momentum. Chicken Says, “Cluck!” by Judyann Ackerman Grant. I quite enjoyed this book! A pair of kids are growing pumpkins and the chicken comes over to “help” but just gets in the way. But the chicken does come in handy when the grasshoppers come around. A sweet and funny early reader.